Please pass this information along to your contacts who may have relatives or friends who have been evacuated from Fort McMurray wildfire area. This information could be helpful in any situation in which there is an emotional stress and exposure to smoke, especially from a wildfire. 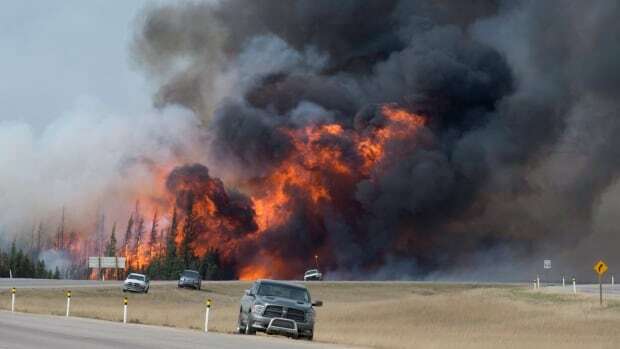 Smoke inhalation from wildfires can potentially trigger allergic type reactions because a smoke is considered a noxious stimulant to the human respiratory system. This allergic reaction could be strong in those with an existing respiratory or immune system vulnerabilities. Wildfire smoke is a combination of gases and particles, both of which can cause irritation and damage to sensitive mucosa, especially to pulmonary system. This irritation can result in injury to the tissues and bronchial spasms as well as triggering inflammation as an immune response. The side effects of smoke exposure could be skin problems, joint and muscle pain, eye inflammation, coughing, bronchial spasms, overall inflammation of the respiratory tract and fatigue and any other conditions because of the immune response. Very young or very old people and people with preexisting conditions such as pulmonary obstructive disease, asthma, emphysema, heart disease, chronic sinusitis or even seasonal allergies will be extra susceptible to respiratory distress. For irritated eyes use eyewash to rinse the eyes. It is better to use a herbal eyewash which you can make. Calendula (marigold), Hydrastis (goldenseal), Chamomile, and Euphrasia (eyebright) are all wonderfully soothing herbs for irritated eyes. Make an infusion by adding a handful of one or more of these herbs, fresh or dried, to a pint of freshly boiled distilled water. Cover and let it steep until cool, then strain. Be sure that the infusion is clear. Anti-oxidants – smoke causes inflammation via oxidative damage. Take vitamin C supplement or food with high vitamin C content (cabbage, sweat green paper, oranges, strawberry, black currant, papaya, pineapple, kiwi, cantaloupe) and other anti-oxidants. Vitamin A - helps keep the mucus lining of the lungs healthy to adequately expel the offending particulate matter (particles and smoke). Take supplement or food high in vitamin A (liver, fish oil, eggs, orange and red vegetables; carrot, broccoli). Vitamin D3 – supporting the immune system. Take 2,000 - 5,000IU/day for adults, and 2,000 – 3,000 for kids. Take food with high vitamin D content (oily fish, such as herring, mackerel, sardines and tuna; mushrooms, especially portabello; caviar, tofu, dairy, pork). Milk – we know that milk creates a lot of mucus that usually leads to respiratory and sinus infections. In this instance however, it is recommend drinking milk because the formation of mucus in the nasal passages making it soothing on the membranes. So the reason we usually avoid consuming dairy, becomes the reason we want it for dried out passages after any smoke exposure. Oatmeal. Cooked oatmeal served with milk - they are full of minerals and water. Greens and other vegetables -fresh and steamed contain water and minerals. Sprouts – soak organic seeds in water in a jar overnight. Choose a cool dark place to keep them. Then rinse them several times daily until they sprout. Fruits are great as a snack and to help with quick energy. Bananas are of particular benefit because it helps with energy, contains vital minerals and has a mild mucus stimulating effect on the membranes. Water, especially mineralized water with a pH above 7 is particularly beneficial to get rid of toxins that was inhaled. For an adult drink at least 3L of water in 24hours. If possible take a bath with 2 cups of Epsom salt - it gently detoxifies your body. There are a lot of homeopathic remedies that will aid in a situation like this for you, your loved ones, or your pets. For stress, anxiousness and sleep problems - Rescue Remedy. For bruises, apply Arnica ointment or Traumeel ointment. For stress related to any lose (house, business, pet, loved one, etc.) – Ignatia. Arsenicum Album: For smoke exposure with anxiety. Eyes burn and stream. Nose burns and streams. Cough is dry and worse at night. Tremendous anxiety especially about what is going to happen.n Restlessness. Euphrasia: For simple smoke exposure with irritation to eyes and possibly nose and no other symptoms. Eyes stream and burn - lids are red and swollen and sensitive. Nose streams but doesn't burn. There may be a mild daytime cough with mucus. The eyes stream on coughing. Kali bichromicum: For more serious smoke exposure with irritated sinuses and/or lungs. Nose is blocked - nasal discharge is dry or comes out in sticky or stringy 'plugs'. Sinuses are sore, raw, irritated and painful. Cough is painful. Chest is sore. Mucus coughed up with difficulty and is scanty and sticky or stingy. Natrum arsenicosum: Great sensitivity to smoke. Eyes dry and painful and stream. Sinuses feel blocked and painful. Rattling cough. Lungs feel full of smoke. Headache from the smoke. Bryonia. For soreness in larynx and trachea. Hoarseness, worse in open air. Dry, hacking cough from irritation in upper trachea, must sit up. Cough is worse after eating, drinking or going into a warm room. Frequent desire to take long breath. Must expand lungs. Difficult, quick respiration. Causticum. Hoarseness with pain in chest. Larynx sore. Cough with raw soreness of chest. Cough with pain in hip. Better drinking cold water. Pain in chest with palpitation. Cannot lie down at night. Eucalyptus. For people who do not breathe well for any cause. Individuals who almost drown and people who suffer from smoke inhalation in a fire. Eucalyptus oxygenates the system and improves the lungs. Carbo Vegetabilis. Wheezing cough with burning in chest. Short of breath. Oxygen starvation, must be fanned. Hoarseness, cough with itching in larynx. Sore and raw chest, rattling of mucus in chest. Exhausted, weak. Cold clammy skin, cold breath. Better from cool air. Worse in the evenings, open air, warm damp weather. Euphorbium officinarium - Breathing oppressed, as if chest were not wide enough. Spasmodic dry cough, day and night, with asthma. Violent, fluent coryza, with burning cough. Constant cough, with stitching pain from pit of stomach to sides of chest. Warm sensation in chest. Silica. To help the body eject inhaled particles (from a smoke of fire). Nose dry and blocked, no sense of smell or taste; sinuses stuffed up; cough is dry, and irritating from inhaled particles. Mucus is lumpy and yellow. How to take homeopathic remedies: Take 6C, 12C or 30C, 3 times a day, 20 minutes away from food and drink, stopping on improvement and repeating as needed i.e. if your symptoms return. If you've taken a remedy for 2 days with no improvement select a different remedy or consult a homeopath. Local whole food store usually have most homeopathic remedies in stock. Important If you are under constitutional homeopathic treatment then check with your homeopath before taking one of these remedies to make sure it is (a) the right remedy and (b) that the remedy has a good relationship with your constitutional remedy and won't inadvertently 'antidote' it i.e. stop it from working.